It's all fun and games until you're all desperately attempting to kill off a Star Spawn before he can escape into the world, and suddenly one insane teammate starts chanting in an otherworldly language and sacrifices another insane teammate to Shub Niggurath with the ritual dagger he picked up a few turns ago. Game over, man. Game over. Oh, and there was some sports thing on the TV in the other room. Strangly, I could smell pre-rain ozone in the air as I made my way towards our weekly Wednesday night games meetup at the family restaurant by the sea. But there wasn't a cloud in sight or any hint of rain in the forecast. The breeze was blowing in from the ocean, and the marine haze was thin enough that I could see the Channel Islands in the distance as I sat at the off-ramp traffic light. The sunset was beautiful, the palm trees were swaying, and when I left my car I could smell salt in the air. Just another night in Southern California. It was a banner night for me: I won all but one game I played, for a total of four wins. Granted, two of the games were cooperative and one of them was largely luck based, but I'll take what I can get! As people were trickling in, Baker Josh and I started with a game of Codenames Duet (which quickly turned into Codenames Triad and then Quad and so on...) We lost our first game when Josh unwisely gave the clue "sand" when "castle" was an available choice, especially when I and my reluctant partner Matthew had been considering castle for the clue "fish" earlier. He was attempting to push us in the direction of "bikini" (which was my next guess) and disk (as in "disk sander", which I never would have thought of). The next game went much better, with the other side guessing our last word in sudden death. Then we split off into groups. Since we had two new women joining us with very little experience in the realm of strategy gaming, I opted out of the offered game of Spirit Island, which normally I would never turn down. I figured most of the guys wanted to play something meatier and I should focus on making the newcomers welcome with something a little tamer. After playing the "what game should we play?" game for a while, four of us settled on Sleuth and the other half dug in to a game of Raiders of the North Sea (must be another new Kickstarter acquisition because I've never heard of it). It's been a while since I played Sleuth, so it took me a few moments to remember my game-winning note-taking strategy. Said strategy won me two games in a row against the game's owner, so I was feeling pretty good about myself. One out of the two newcomers seemed to be as taken with the game as I am - she was the one who suggested the second play, and the only thing that kept me from agreeing to her suggestion of a third play was that the other woman who'd joined us didn't seem to be enjoying it much, and was struggling to grasp some of the mechanics of the game. We finished off the night with a quick game of Qwixx, which I also won - not an earth-shattering victory since it's a dice game, but like I said, I'll take what I can get, considering I usually win a pretty small percentage of games I play. Playing with newcomers is sometimes a struggle - I want to make sure we start light so they don't get overwhelmed with heavy strategy too early on and get discouraged, but our group generally favors heavier games and the cult of the new at that. We have one woman in particular who shows up on occasion and tell us "I don't care what we play; I'll play anything," and then doesn't understand why this is a difficult concept for us. I don't think she understands that when she says this, we have to take into account her experience level (low), ability to process new-rules and complex strategies (still developing) and how willing we are on that particular night to slow down our game significantly to walk her through it (varies by person and week and moment). But it's hard to say that without being rude or alienating. I think I need to acquire a few more starter Euro games to bring with me for occasions like that (usually someone brings Carcassonne or Stone Age, but I dislike the latter and have limited patience for the former). Like Puerto Rico. Or even Catan! What are some other entry-level (and yet still fun) Eurogames I should consider for my collection when I have some spare funds? I guess I should probably give Ticket to Ride more credit than I do. I want to write about this past Wednesdays' game night, but no time right now. However, I just read an excellent Galaxy Trucker retrospective that I think anyone familiar with Vlaada, this game, or its excellent witty rulebook, should go read. So I'll leave you with that, and try to blog about Mansions of Madness and Camel (C)Up tomorrow. - After surviving hours of of zombie onslaught in our heavily fortified base on Friday night in 7 Days to Die, exactly one quarter of the rooftop farm I spent hours working on inexplicably collapsed under my feet at midnight as I tilled one of the last squares of soil, and I plummeted 60 m to my death. As of yet, no one in my group (which comprises several engineers and computer programmers) has been able to figure out how to fix this. Game physics are weird. - I only played THREE games this past weekend. And two of them were video games. That is not nearly enough. - Kyle and I were dragged through the streets, presumably to our death, by a creepy Innsmouth Mob on Sunday night after they burned down the dock that was our only hope of escape from the town. Jerks. - Everyone other than me at our Gamechurch staff meeting yesterday has a Switch now, and they won't stop talking about Mario and Zelda. I am feeling like an outcast and a bad gamer. - It's over a week into the new year and I have yet to play a single new-to-me game for my 100 x 1 challenge. - I've played my semi-annual game of Lovers in a Dangerous Spacetime with Kyle. Now who knows how long it will take before we get together to take on the next level and fight Orion. And our little pink gumball spaceship is so badass now! On the plus side, I did manage to stay awake until midnight on Friday night (the first time in weeks that my interest has lasted that long! ), and I'm starting to get excited about the possibility of going to Orccon in a month. All good signs for my mental and emotional health. The air smelled much the same at the diner by the sea on Wednesday night for the not-so-triumphant return of our team, the Fearsome Four as Tim calls us, to the world of Pandemic Legacy. I won't give any spoilers but I will say that Season 2 is proving to be a lot more difficult than Season 1. We've now lost three games in a row, and more and more often we find ourselves facing defeat before we even begin. This game is brutal. Which didn't help my mood. I started the evening in high spirits, ready to jump back into the fray. Then realized I didn't quite remember how to play the game (our last play was in mid-November). Then realized we were going to lose. And lose again. Watching the world fall apart before our eyes, even in just a game, without any humor to accompany the crisis, combined with my already faltering self-esteem and motivation, didn't really bode well for my energy levels. I was pretty well drained after two hours of gaming. Didn't help that SOMEONE on the team played through the entire campaign with his other so-called friends while evacuated due to our wildfires last month, so he already knows the rest of the plot and has been banned from giving us any spoilers. Fortunately, my friends were sympathetic to my plight when I told them I only had one more light game in me before I left for the night, and played a 7p game of 6 nimmt! with me. Which is always good for a laugh. It's one of my favorite light card games for a group. It has some strategy... but just enough to give you a false sense of security. Still, I came close to winning for a round, which gave me a much needed boost. Honestly I didn't mind the crappy games. Playing stupid games with people you like is better than playing good games with no friends, and I always want more laughter in my life, even if we're only laughing to alleviate the pain! Saturday I dragged myself down to our Saturday gaming meetup where I mostly felt like myself (until I ran out of steam and had to go home around 9) and ended the year with three more new games for my 100x1 challenge, including an introduction to Kingdom Death: Monster. I've been watching our friend Oscar be obsessed with it from a distance and have been curious about playing with him. I'm still skeptical about the idea that hunting the same three monsters over and over again won't get dull, but so far I'm intrigued enough to play through a couple more sessions and see. It has a lot of game elements that I find really appealing, and generally I trust his taste in games. On Sunday the roomies and I ordered pizza and had a few friends over to hang out for the evening. I had been invited to a party and also to go out swing dancing, but I didn't feel up to being around a lot of people, so I declined both offers. My original plan was Netflix and early to bed. I'm afraid I wasn't great company and staying up until midnight was rough (and shows where I'm at health-wise considering I was not-infrequently staying up dancing or gaming until after midnight over the summer without trouble, even a few times on worknights). I'm grateful to our friends that they didn't drag me up to the dining room to play board games and instead were willing to play Fibbage 2 and Quiplash for hours. But I would have been happy to play some medium-light tabletop games... if I could have played them from the couch. Why is this not a thing? Tabletop games that can be played without a common surface? This would be a great addition to my games collection. There are times that I am torn between playing a game and staying comfy in the living room, but even a lot of party games these days require a surface for cards or a board. We all have smartphones - what about games for Steam that we could stream to our TV and play on our phones, like Fibbage, but that are more serious strategy type games? I suppose Bidiots fits into that category (another Jackbox game we tried out on Sunday night,) but I never fully understood what we were doing. Maybe we need to give it another try. Now that I'm feeling a tiny bit more like myself and the holidays are over, my Pandemic Legacy group will be reunited this Wednesday, and I'm sure that people will be bringing their new Christmas acquisitions. I've also participated in challenges on BGG the last two years. It's been a good way to push myself to explore different kinds of games and gaming, and it's been fun to drag others into the madness. Last year my goal was simply to play all the games in the BGG top ten, and after reaching that goal, I've added it as an ongoing challenge for myself to always play these games that surge in popularity. This year I joined a 100 x 1: 100 different games in 2017. But that sounded too easy. So I made my own personal challenge to play 100 games I'd never played before. I thought even that would be simple, but it proved a lot more difficult than I expected. Going to Gen Con for the first time and demoing lots of games helped. So did having a very understanding gaming group with large collections of obscure games (and short games) they were willing to play with me to boost my numbers. This past Wednesday we met for our regular Weds gaming night and we played five short, new-to-me games - entirely for my benefit. If it weren't for my challenge, "Joking Hazard" would never have made its way to our table - we're the Ventura County STRATEGY Boardgames group, not the Ventura County Light Party Games group. I think everyone is relieved that my challenge is over and that we can stop playing terrible games just for my benefit. What gaming goals did you accomplish in 2017, and what are you thinking about setting as new goals for 2018? I'm going to attempt to actually keep up with this blog again. 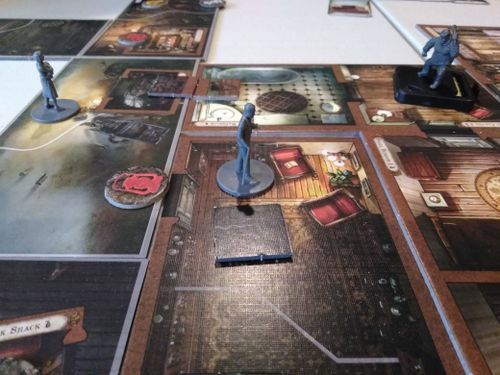 It seems that interacting with tabletop gamers is good for my mental health (and doing it away from the information overload of Facebook is even better). I recently went to Gen Con 50 as part of the editorial team for Gamechurch.com, and we demoed tons of games. We also interviewed a bunch of game designers. After some deliberation, we came up with a list of games from the con that we think Jesus would love. This is part one of three of that list.